In a perfect world, I would have preferred to have a sport wagon or an estate wagon because I’ve always enjoyed smaller vehicles and vehicles that handled well and were a bit more fuel-efficient. 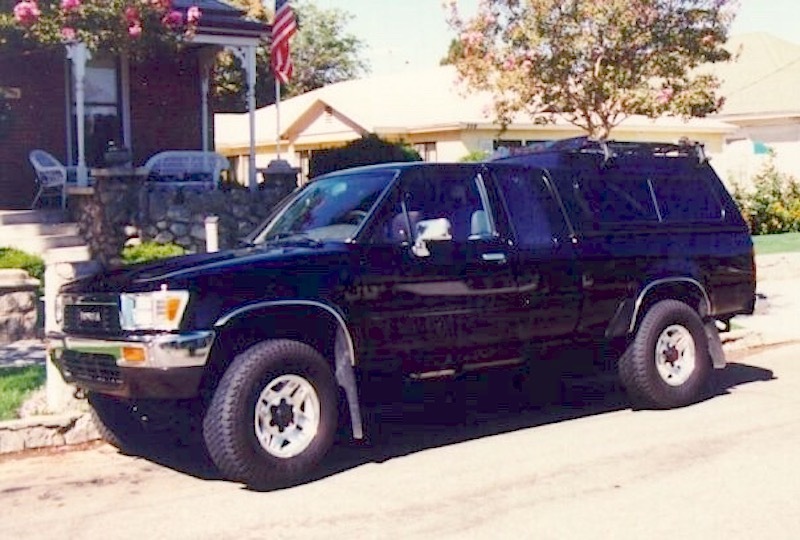 The 4Runner came close to being that ideal vehicle, but I will confess I was always smitten by the Subaru Outback before it got upsized from a Crossover to a small SUV and the Mercedes E55 and E63 Estate Wagons, a couple of supercharged V8 grocery haulers had more power and speed than most Corvettes. But, roof-topping a tandem was never something I liked to do, so having a truck big enough to swallow a tandem became the norm. So, from the outset as we looked to replace our 2006 Toyota Tundra with something a bit newer and more reliable, it was pretty clear it would be a truck. Having looked at all of the full-size trucks, we found them to be just a bit bigger than they needed to be. Even the midsize trucks weren’t all that much smaller than our Tundra. But, what all of the trucks lacked was a full-size bed that could swallow our somewhat longer than normal Calfee tandem without having to remove both the front & rear wheels. Moreover, whatever we bought would also need to roof-top our 3-seat tandem (aka, the triplet). And, unlike the Tundra, the next truck would need to have 4WD. It’s not something I need all that often, but when you do need it there’s just no substitute. There were far too many winter storms where our heavy 2WD Tundra just couldn’t get us out of our iced over hill in the community while folks with 4WD and AWD trucks and cars had no problem. So, a 4WD mid-size truck with a crew cab and bed large enough to carry the tandem inside or the triplet on the roof was my target vehicle. And, it didn’t hurt to know our son Wesley, who has owned several trucks since his 1st one, a 2006 Tundra (it was his truck that caused me to get our Tundra shortly thereafter), including the Toyota, Chevrolet, GMC and Ford said the truck he liked the most out of all of them was his Tacoma Crew Cab. 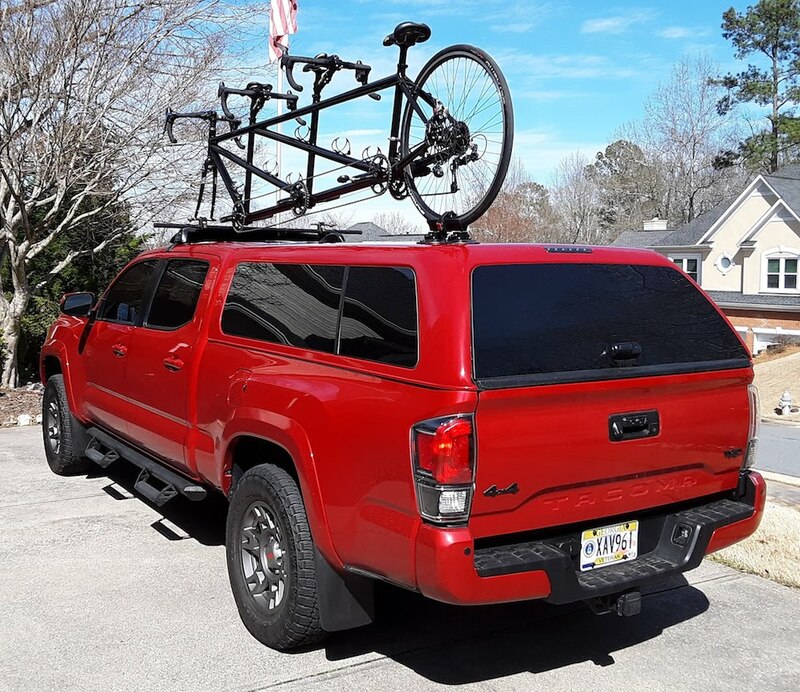 So, having considered all of our options, a crew cab, long-bed Tacoma began to seem like it would be our best bet, despite missing the mark by a few inches on carrying the tandem in the bed with the rear wheel still attached. The need to remove both wheels wasn’t a big deal, as we had the same issue when we bought the Erickson tandem back in 1998 and I still had my 1989 Toyota Extra-Cab pick-up, back when Toyota only had one truck and didn’t need a name for it. While both the ’89 and ’06 Toyota trucks have 6′ long beds, those beds are narrow and the lack of width was the limiting factor. But, as I said, it wasn’t a big deal as I simply fabricated a new fixture to hold the tandem upright without its wheels tailor-made for the Tacoma; full details on that project can be found in this blog entry from 12 January. 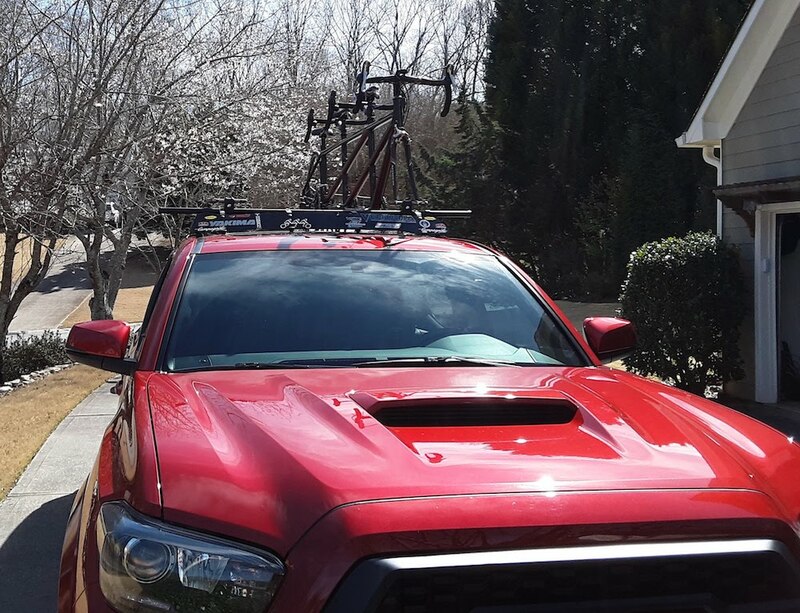 Roof Topping the Triplet With A Yakima Sport Rack System; Easy, Right? As for the triplet, I confirmed the Tacoma could easily accommodate the 9-foot long-span between the front fork and center of the rear wheel in much the same way we carried the triplet on the Tundra. 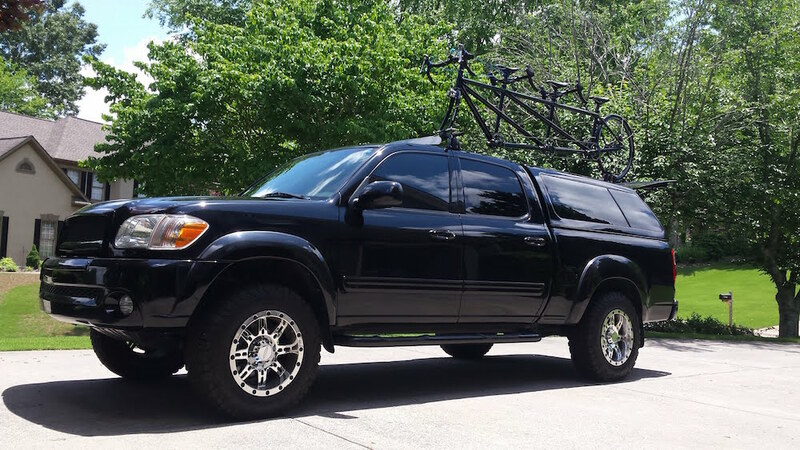 However, I falsely assumed I’d be able to use the same Yakima towers, crossbars and mounts on the Tacoma I was using on the Tundra, with just perhaps a new set of mounting clips and feet for the slightly different roof design. This would have kept the cost down since we only use the roof rack 3-4 times a year when we need to take the triplet to an event. 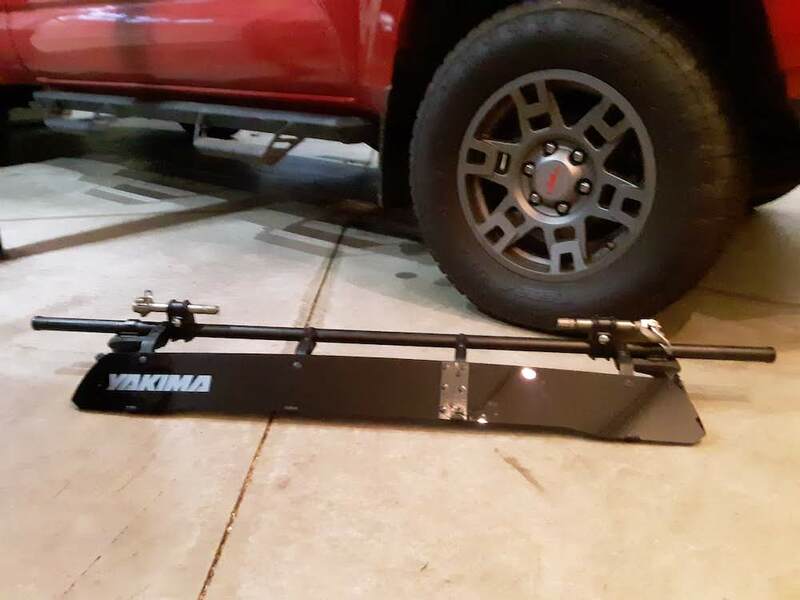 Well, it turned out Yakima moved to a completely different tower design for the newer Toyota trucks such that an inexpensive mounting kit for my 16-year old Q-Towers was no longer offered. 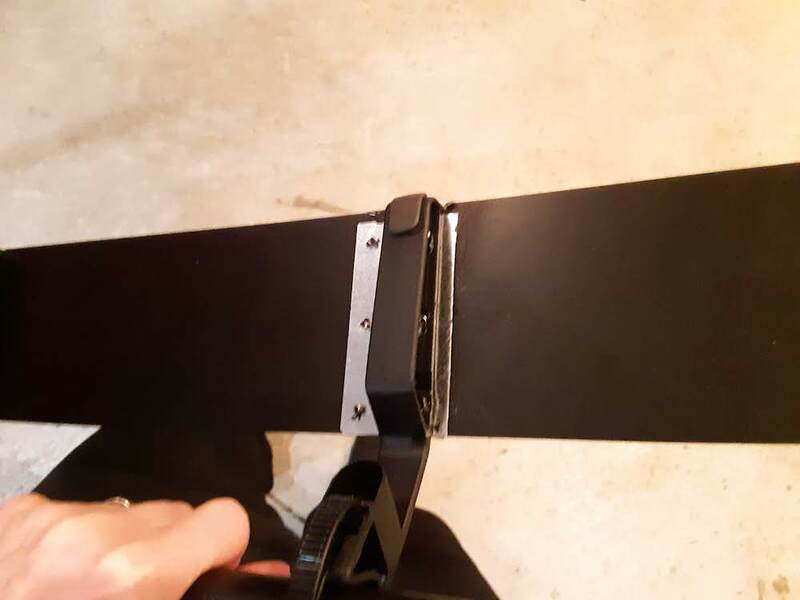 Instead, I’d have to buy new towers, mounting clips and an adapter for my round crossbar along with a new fairing: all told, about $300 worth of new hardware vs. $45 or a set of Q-Clips as I’d originally assumed. I paid a visit to our local REI store fully expecting them to have everything I needed; no such luck. 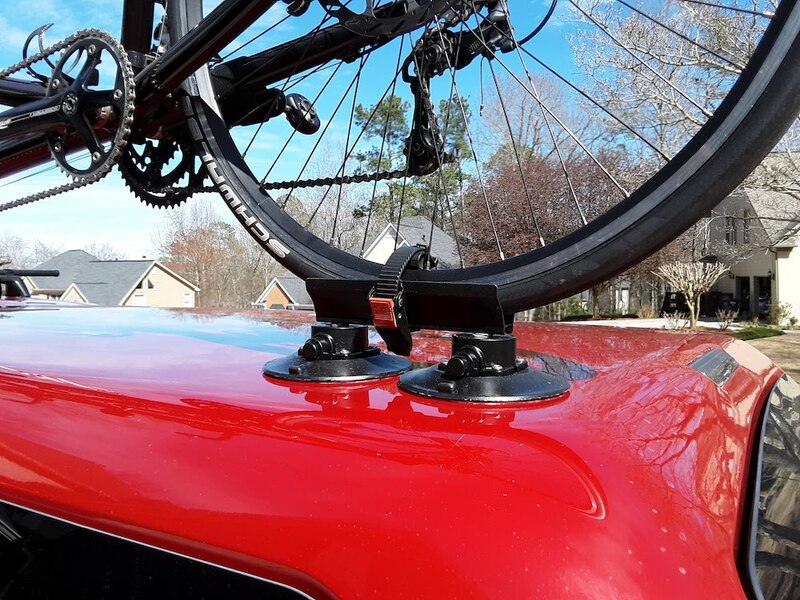 Over the years Yakima has had to eliminate all of the product variability and consumer use of common sense such that every vehicle now has a unique rack configuration, and working outside of those guidelines is frowned upon. So, REI could sell me a set of four towers, but not two. 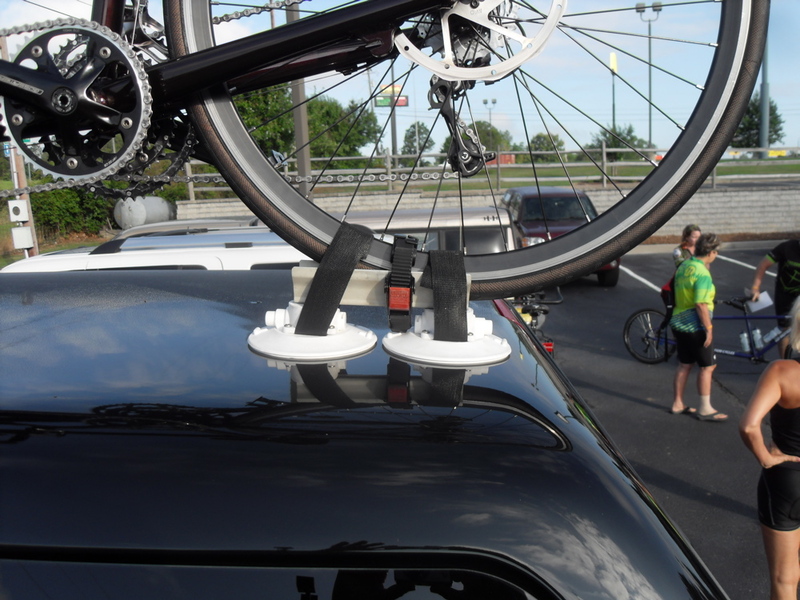 They had a set of four round bar adapters for those four towers, but a pair was not even offered by Yakima. Just one of the two sets of different clips needed for the Tacoma — the #1 selling mid-size truck in the U.S. — were in stock; just one… buy you can order it on-line! Oh yeah, this is going to be fun. I ended up buying a pair of towers from a bike shop in Lancaster, PA, when I got back to the house and they arrived four days later. The round bar adapters worked like a champ, but the one set of $60 clips REI had on hand (BC-145) were too short to work where I needed to place my crossbars for the length of the triplet; this was a bad omen. Well, if the front clip was a bit too short, certainly the rear clip specified for the Tacoma would have enough adjustability to work a few inches further forward from its designated location per Yakima’s installation guides. So, I ordered the rear clip (BC-128) from an on-line etailer at an awesome $47 price and waited for those to arrive. The 2nd set of clips arrived two weeks later and even though there wasn’t a pressing need to get the racks on the truck since our 1st triplet outing was until 11 May, I was anxious to make sure the system would work. Well, guess what: the rear clips were too long, by about 2mm. Seriously? 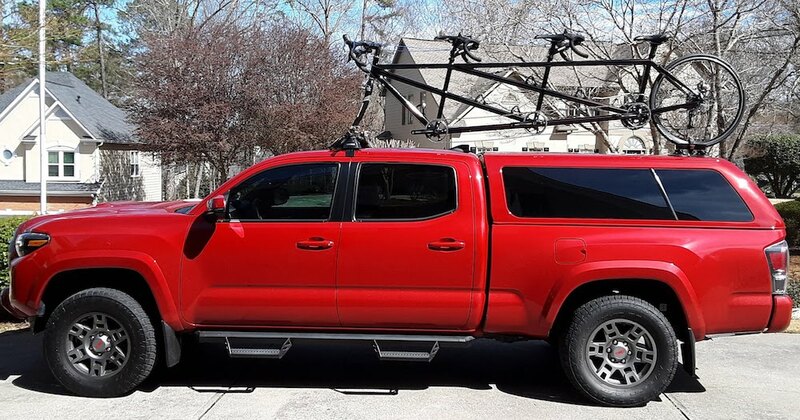 Yakima has apparently had to make these roof racks idiot-proof to the point where everything is a precision fit so neither the front nor rear clips that work on the Tacoma will work at a point 1/2 way between where they would normally be mounted, per Yakima’s installation specification. This is as much a design issue with the Tacoma’s roof as it is Yakima’s clip sizing. To make matters worse, the way their roof mounting systems were packaged, it was nearly impossible to determine which clip-set might work based on the information Yakima made available to consumers… again, because consumers are idiots who want manufacturers to pay for things when they screw up. Since I couldn’t find any way of determining Yakima’s clip sizing I sent off a request for a recommendation to Yakima’s technical support center, noting the clips that WERE recommended for the Tacoma spanned a roof door to rain rail gap of 7.5cm and 11cm, respectively front to rear. I needed a clip that spanned a distance of 9cm: pretty straight forward. My sincere apologies. I do not have the information to prove to you as we would not recommend using our products in this manner. The question is two-fold: 1. provided to you a document with the specifics of each BaseClip and/or 2. provide to you a recommendation. 1. I do not have access to that type of documentation. It is sensitive information that we will not release to the public. My apologies! 2. Basically, every BaseClip and Pad combination is designed specifically to fit in a specific mounting location for every specific vehicle. Because of this I really can not recommend going outside of our recommendations. I apologize for not being able to answer accurately your questions. If there is anything else I can do for you, please, let me know! Yes, I blew my cool when I received this grammatic nightmare of a semi-canned response. Here I am with $250 worth of new Yakima rack tower parts — yes, they’ve gotten insanely expensive, that’s just two towers not even a full set of four or the cross bars and bicycle attachment racks that go on the system — and it won’t work on our truck. After I cooled down I sent back a terse reply that essentially said, I get you can’t go outside of Yakima’s guidelines, but that is an unacceptable response. Later in the evening I did a little more digging and may have broken the code on the sizing, finding three potential clip numbers that might work is my assumption on clip numbering is correct. However, the challenge now was finding a Yakima dealer who actually had all three of these clips in stock so I could compare them side-by-side with the slightly too long clip I already had in hand. That left me having to order the pricey clips on-line, hoping I guessed right, less I have to keep buying and returning clips until I found one the right size… or getting out my saw and vice to shorten the one I had by 2cm. I opted to order one of the three candidate clips from REI on-line on 23 February and am now awaiting its delivery. Unlike most purchases off ebay, REI is not sitting on inventory. So, the clip I ordered back on 23 February didn’t get shipped by REI until 27 February (meaning they had to order from a warehouse and have it shipped to them) and isn’t due to arrive at my local REI store until 7 March. So, here we are on 12 March and after the clip left REI’s warehouse in southeast Pennsylvania on 27 February, it finally arrived at the REI store in Kennesaw, Georgia, on 11 March. I was told weather was an issue. Setting aside the logistics, I guessed right! The clip model I picked was just about the perfect length for getting a secure clamp on the roof of the Tacoma right a the B-pillar. I had to do a little fine tuning to the three different adjustment points on the tower body, but by-golly I was able to achieve a great and secure fit with the clip I ordered. Yes, I’m now left with a set of tower feet and a clip that’s too long for my needs, but it was worth it, especially since I had no help from Yakima in finding a solution. So, without further adieux — you can read the adieux after the reveal — here is our new triplet hauler! Please excuse the filthy condition of the truck, it’s been raining here for weeks and today just happened to be the 1st nice day we’ve had. But, my schedule was a bit too full today to fit in a truck wash ahead of the photo shoot! It’s a very similar set-up to the Tundra, but the bike mounts sit about 3″ lower than they did on the Tundra, mostly because of the cab height not the suspension and tires; the Tundra had twice as much headroom as the Tacoma. But, in this case, less is more… more better. It’s still a bit of a hefty lift getting the triplet up and over my head given it’s length and 38lb weight, with the front wheel removed. but, it’s a good fit. For more info on the suction cup rear wheel mount and the saga of our fairing, see below. 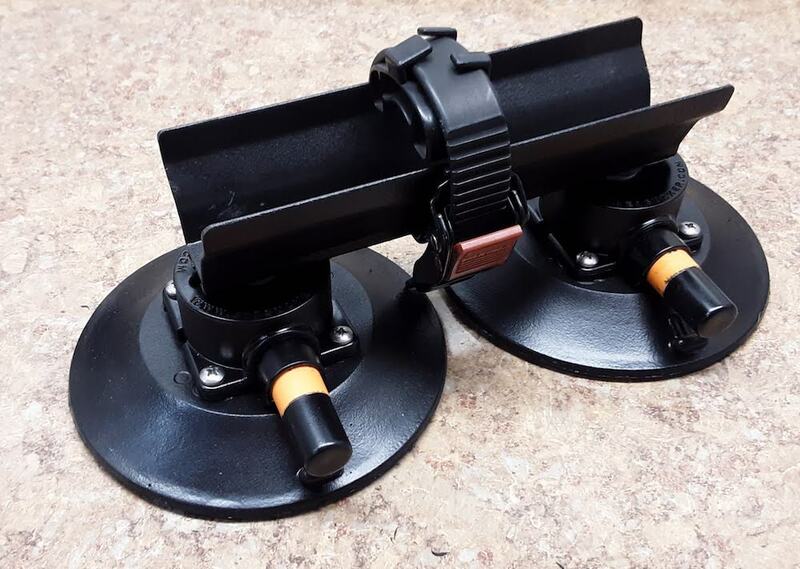 While I was working to square away the front crossbars for the triplet, I decided it was time to refresh the two suction-cup mounts I used to secure the rear wheel of the triplet to the top of the Tundra’s A.R.E. shell before putting it on the Tacoma’s A.R.E. shell. I bought these back in 2012 when we acquired the triplet and didn’t want to drill holes in the shell for a traditional roof-mounted rack system and they’ve worked-out really well. As you can see from the photo at right, when I bought these ‘Sea Suckers” as they’re called, they were marketed primarily for use on boats as temporary mounting devices for fishing rods, beverage holders, electronic equipment and the like and, as such, only came in white. Although they’re now offered in black, I figured I’d see if I couldn’t refinish my white Sea Suckers with a combination of flexible, rubberized “Plasti-Dip” coating on the upper part of the rubber suction cup base, a self-bonding “Fusion” paint on the plastic housing and plunger and then some bed liner paint on the small, aluminum rear wheel tray before putting them on the Tacoma. I must say, I think they turned out rather well. The question is, will the various sprayed-on coatings hold up! Someone asked a couple good questions regarding the Sea Suckers, which were… have they ever come loose and how long do they hold vacuum? The answer to the first questions is yes and no. I have seen one of the plungers showing part of the orange “alert” band after several hours on the road to a rally, but it was still holding fast and the 2nd Sea Sucker was fine. As far as how long do they hold a vacuum, pretty darn long. I can recall taking the triplet to Athens for GTR and leaving the Sea Suckers on the truck for all three days. I may have had to give one of the plungers a pump or two before we headed home. Now, I will go on to note that I do use two for the triplet vs. just one given how much load the very long frame could put on the Sea Suckers in a heavy crosswind condition and from wind blast coming off of trucks. However, in certain respects, having the two Sea Suckers connected by the rigid wheel tray may actually cause one Sea Sucker to work against the other since there is no give at the mounting bolts. I considered using rubber bushings under the tray so it would have some float, but then reconsidered as I really didn’t want the long triplet to be wavering back and forth. So, I hedge all of my bets by dealing with the two Sea Suckers plus a tether line tied to the rear wheel that runs through the truck shell’s rear door to an anchor, such that IF both Sea Suckers came loose for any reason, the rear wheel would not be free to move by more than a few inches, if at all, noting that one time many years ago I forgot to strap down a rear wheel on a mountain bike and saw what happens when you make a sharp turn with just the fork secured in the front clamp. 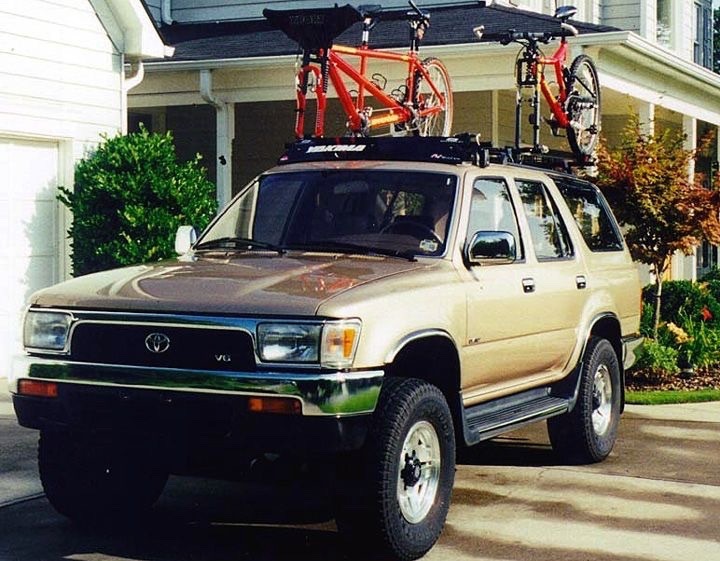 Thankfully, there was very little damage to the mountain bike or the Brahma shell on our ’89 Toyota truck… but it was a valuable lesson in physics. 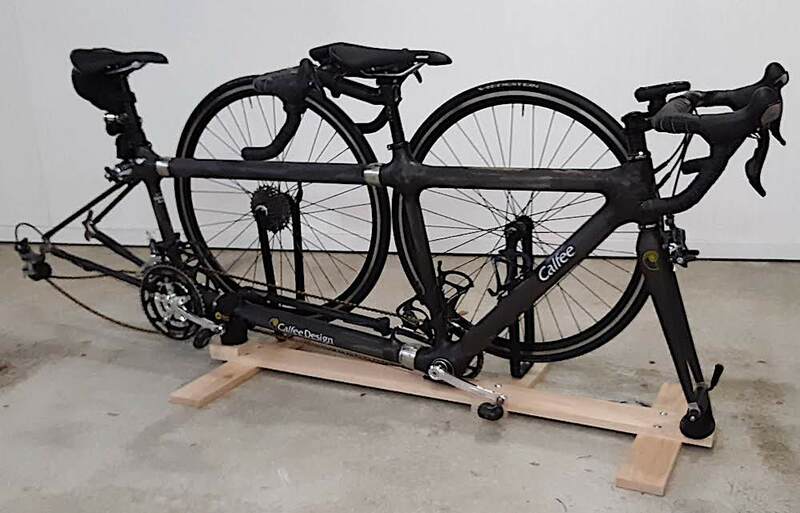 I’ve also considered using the pair of Sea Suckers as pseudo towers for a rear crossbar installation, but since the only time I roof top is for the triplet, the tandem arrangement with small wheel tray has been all I needed. In addition to my Q-Towers and clips not working on the Tacoma, it turns out neither of the three fairings I owned would work either: the attachment hardware mounting points were in the wrong places. Yup, it just kept getting better and more expensive. On the bright side, in the background I had listed all of my old Yakima sports rack equipment for sale on Craigslist and made enough selling that to cover all the costs of the new rack equipment, less the cost of the new fairing. But, being frugal, I bought the $115 fairing off ebay from a clearance center for $70 including shipping; sweet! Well, the sweetness of the deal quickly faded when the rack arrived and the box it came in looked like it had been crushed somewhere along the line. Sure enough, the fairing had been broken… broken, removed from the box & packaging and then put back in the box in such a way that it was clear it had been repackaged after being broken. The silver lining in all of this was the seller issued me a full refund for the damaged fairing and said he did not want to pay to have it returned, so just discard the thing. Well, me being me, I always like to fix things if they can be fixed and I did just that with the fairing. It’s now something of a Franken-Fairing replete with six rivets I used with a thin piece of galvanize metal to rejoin the two broken halves of the Lexan fairing. It’s an obvious repair, but what it lacks in aesthetics it makes up for in functionality. I’m now in the process of camouflaging the repair by covering the fairing with the ubiquitous cycling industry brand decals. Sadly, having previously “decorated” three Yakima fairings that are much larger than my new one, I’ve pretty much used all of the brand decals I’d collected over my many years of cycling and came up a bit short. I did something of a social media-based scavenger hunt to obtain a few more classic brand decals to finish cluttering up my fairing and two long-time friends, Dan from Colorado and Alex from Georgia, came through for me such that it’s now properly cluttered with decals. I've been around a bit and done a few things, have a couple kids and a few grandkids. I tend to be curmudgeonly, matter-of-fact and not predisposed to self-serving chit-chat. Thankfully, my wife's as nice as can be otherwise we'd have no friends. My interests are somewhat eclectic, but whose aren't? This entry was posted in Technology & Equip.. Bookmark the permalink. I really enjoyed the process that you went through to get to the finished product. My kids nicknamed me McGuyver (sp) due to my attitude toward fixing/repurposing things to fit my “vision” for a particular project. Also, we enjoyed our 4wd Tacoma. Nice truck! "Cultivators of the earth are the most valuable citizens. They are the most vigorous, the most independent, the most virtuous, and they are tied to their country and wedded to its liberty and interests by the most lasting bonds."